My bestest friend moved to New Orleans last week. He moved there on the heels of another good and great friend who moved to New Orleans about a year-and-a-half ago. Sigh. It's starting to feel that the spell cast by the Crescent City is taking my St. Pete friends away one by one. I'm thrilled for both of them, though life around here will most definitely be a lot less animated. I have visions of them sitting in the dim light of louvered windows on a sweltering afternoon as they sip lemon cokes with chipped ice à la Blanche Dubois. 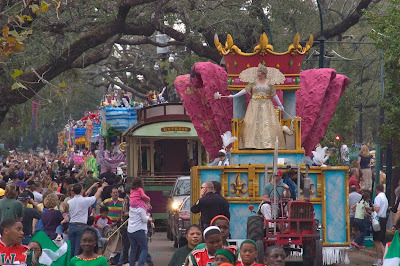 That is when they're attending the many festivals, parties and costume balls the people of Nawlins throw to keep themselves entertained. Ho hum, and here I am stuck in work-a-day Florida. Poor me. I got a phone call on Sunday morning that detailed their plans for an exciting Sunday. They were planning to go to town to go to a food festival and then to take in as much high and low culture as they could get their hands on. I hung up the phone and went back to scrubbing my floors. Scrub. Scrub. Scrub. I have an idea about what their lives look like over there on the other side of the Gulf of Mexico and it looks a little something like this. If this is not what their lives look like I don't want to know about it. Allow me this fellas. Please. There's plenty of chipped ice and lemon cokes awaiting you when you're ready to visit! Whew! I cannot tell you how warmed my heart is by that confirmation. Look on the bright side, Paul. You now have two possible guest rooms awaiting your New Orleans visit. The Big Easy just got easier for you, cher! Oh it sure did. And if my Hello Dolly daydreams are correct, I'll be visiting the Marigny by autumn.